Honey Benefits for Dogs | Can Dogs Eat Honey? Honey contains mainly glucose and fructose. These are simple sugars (monosaccharides) and are more readily absorbed than disaccharides and polysaccharides such as those found in table sugar, starchy veggies, and so on. Raw honey is rich in vitamins A, B-complex, C, D, E, and K. It also contains various minerals such as calcium, magnesium, potassium, manganese, copper, and more. In addition, honey contains flavonoids, which are health-enhancing antioxidants. Raw honey is antimicrobial against various fungi and bacteria. Depending on the flowers, honey can be light or dark in color. The darker the color, the deeper the flavor. Darker honeys, such as buckwheat, sage, and tupelo, contain the most antioxidants. Manuka honey from New Zealand is probably the "kingpin" of all honeys. It is rich in antioxidants, vitamins, and minerals. It has also been found that it has strong antibacterial properties and can kill over 250 strains of bacteria, including MRSA, MSSA, VRE, and Helicobacter pylori. When getting Manuka honey, remember to consider the UMF (Unique Manuka Factor) rating. UMF is a phytochemically derived antibacterial property found in certain strains of Manuka honey. If you want to benefit from the healing qualities of Manuka, you need to get one with a UMF rating of 15 or above. A Manuka Honey Dog Biscuit Recipe! With so many goodies in honey, you may wonder if you can give your dogs honey as well. The short answer is YES! Raw honey, including Manuka honey, is generally safe for dogs to consume. But if your dog has diabetes, you should consult your holistic veterinarian first. 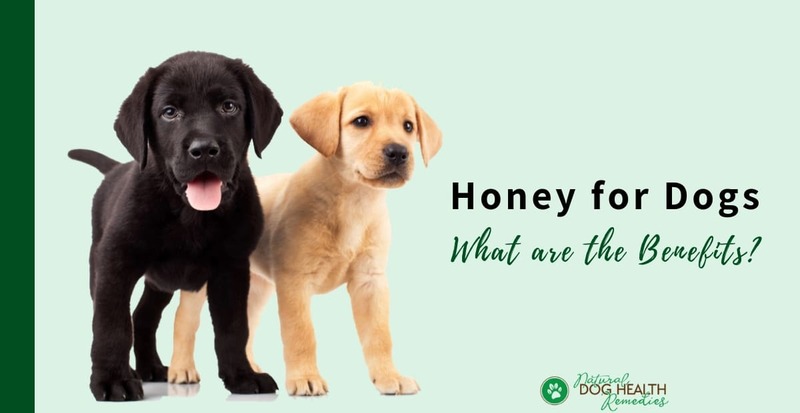 Although tests have shown that some types of honey may cause a lower rise in blood sugar and thus may be safe for dogs with diabetes, data on the types of honey safe for diabetic dogs are not available. How about giving honey to puppies? According to the Whole Dog Journal, it is not a good idea to give raw honey to puppies less than one year old because "raw honey can contain very small numbers of Clostridium botulinum spores, which can be found in dirt and dust." For adult dogs and people, there is no problem because the digestive systems are strong enough to deal with such spores. However, due to their still developing digestive systems, puppies may not be able to handle the spores and could get sick as a result. 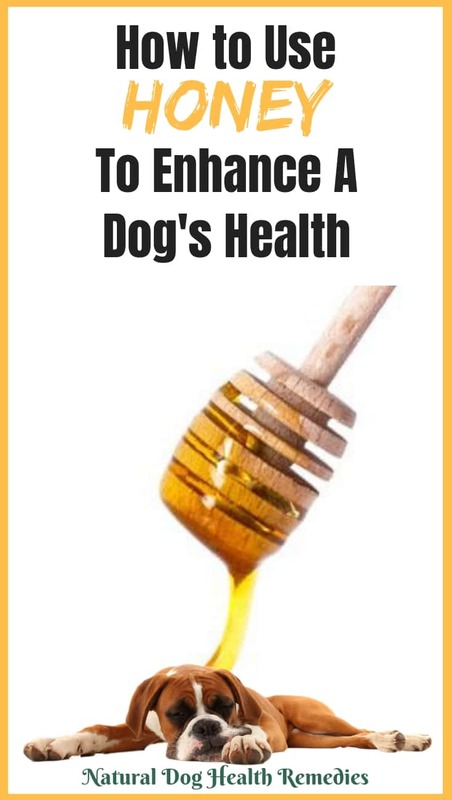 Let's take a look at some amazing honey benefits to our dogs. Honey's acidity or pH is low enough to hinder or even prevent the growth of many types of bacteria. Also, an enzyme in honey produces hydrogen peroxide which is an antibacterial agent. It has been shown that honey reduces inflammation and soothes the pain of wounds and burns. Minor Burns: Clip off the hair around the burned area and wash the area with vinegar. Then apply honey liberally to the area every 10 minutes or so until the pain subsides. After that, you can put a dressing on the burned area lightly. The good thing about dressings made with honey is that they don't stick to the wound, so newly formed tissue is not so easily compromised. Wounds: For other minor cut wounds, scratches, etc., simply apply honey to the affected areas without bandaging. Try to let the honey stay on the wounds for at least 20 minutes or so. In both of the above cases, you need to stop your dog from licking the honey from the wound! If necessary, use a "cone of shame" (E-collar) or something similar. Allergies: If your dog suffers from seasonal allergies, try feeding him a tablespoon of local honey twice a day. (This works for people with seasonal allergies as well!). The minute amount of local pollen in the honey desensitizes the dog's body so that the immune system will not over-react to the pollen when exposed to larger amounts in spring and summer. Upset Stomach: Due to its antibacterial properties, honey benefits dogs who are suffering from stomach problems caused by overgrowth of harmful bacteria, such as gastritis, IBD, colitis, and so on. Coughing in Dogs: Dogs suffering from infections of the respiratory system, such as kennel cough, can benefit from the antibacterial properties of honey, especially Manuka honey. It can also soothe the dog's throat. For added potency, some dog parents suggest using equal parts of coconut oil and Manuka honey for bacterial infections such as kennel cough. Many herbs are beneficial for dogs. But we all know that some herbs are not exactly tasty. Even chow hounds may have their "limits" - they may turn their nose up when it comes to certain herbs! One way to coax your dog to eat herbs is to put a bit of honey in the herbal tea to make it more palatable. Use dried herbs of oregano, lavender, thyme, lemon balm, etc. (ones which have antibacterial, antifungal, and/or antiviral properties). Put the dried herbs in a jar until it is half filled. Fill the jar with honey, covering the herbs. Seal the jar and leave it in a warm place (e.g. by a sunny window) for at least 2 weeks. Before using the herbal honey, filter it through a strainer or cheesecloth to remove the herbs. Store the herbal honey in room temperature or in the refrigerator. Topically, you can use this herbal honey to dress wounds, burns, hot spots, lick granulomas, and other infected skin wounds. You can also give a teaspoon to a tablespoon (depending on your dog's size) orally to your dog to prevent bacterial or viral infections and generally boost his immune system when he is not feeling well. When added to food, this herbal honey helps reduce gas and other symptoms typical of indigestion. Combine all ingredients in a food processor. The dough is ready when it pulls away from the sides of the bowl. Turn the dough out onto a floured cutting board. Knead a few times. Add more whole oat flour if dough is too wet. Take small pieces of dough and roll out to a thickness of about 1/4 inches. Place cut-out pieces on lightly oiled or parchment paper-covered cookie sheets. Place in pre-heated oven and bake for 20 minutes. Turn off oven, let biscuits cool completely before removing them from oven. If your dog has diabetes, consult with a holistic vet first before feeding him any honey. Do not feed raw honey to puppies younger than one year old. When getting Manuka honey, make sure that it has a UMF value of 15 or higher. What is UMF (Manuka Honey Organic).